I stumbled upon Saleem Abboud Ashkar only recently, when I found his Decca Italy recording of Beethoven's First and Fourth Piano Concertos with Ivor Bolton. Neither rates among the very best, but both are excellent, and they were good enough to seek out his EMI Debut recording, which was similar in overall style. When I found these discs, I learned of his project to perform all of the Beethoven sonatas in recital, and I hoped the performances would be recorded and packaged for sale. While hopefully that still may happen, this first twofer of a projected four-release complete cycle was recorded in a studio in January of this year. Ashkar opts for a Bechstein for this release, adding a slightly different dimension. Mr Ashkar, now in his forties, is a Palestinian pianist born in Nazareth who has had the good fortune of working with a cadre of A-listers and recording for Decca Italy and EMI. 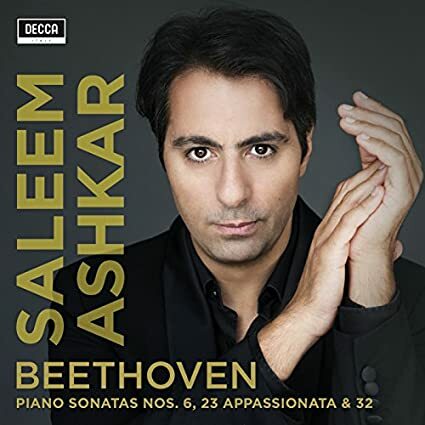 Years ago, when Daniel Barenboim released his third Beethoven piano sonata cycle on DVD, Ashkar was one of the young pianists included in the accompanying master classes disc. 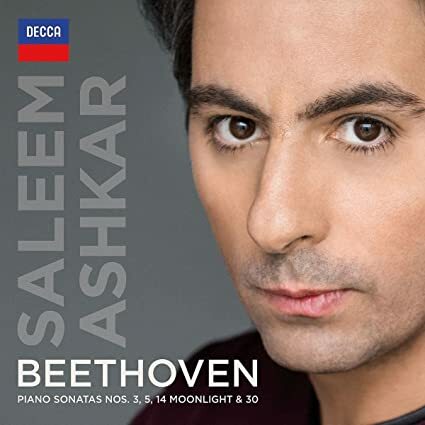 So Beethoven has been on Ashkar's mind and under his fingers for a good long while. That's a good sign. Ashkar opens his cycle with Op 2/3. He plays the Allegro con brio with virtuosic flair and buoyant elan, not weighing down the music, and his Bechstein sounds a bit smaller, warmer, and possessed of a different tonal palette than the standard Steinway, and the metallic patina of his playing of the concertos, as well as on his EMI disc, is gone. His dynamic gradation is excellent. His articulation, too. The Adagio is a bit taut tempo-wise, and Ashkar holds back, keeping in light until the first tolling left hand notes, which sound weighty but not domineering. The playing sounds just a bit more tense, but a sense of classical repose dominates; this is no over the top romantic reading. In the Scherzo, Ashkar pushes things more than in the prior movements, playing fast and loud, with exemplary clarity at all times. Maybe the playing is too serious for the movement, but I dig it, just as I dig the quick and virtuosic Allegro assai. Some of his left hand playing is nicely urgent without sounding overbearing. A rock solid start to the cycle. Op 10/1 follows, and here Ashkar plays the ascending arpeggios at a comfortable tempo but with some accents strong enough to satisfy, and he plays the rest of the movement with superb independence of hands and unyielding but not overwhelming forward momentum. The Adagio molto is suitably paced and serious and deliberate, very deliberate, to the point that it lacks a little something in expressivity. This is not a knock. Ashkar plays the concluding Prestissimo with just the right measure of speed, energy, and dynamic range. The warhorse Der Mondschein follows, and here Ashkar plays the opening Adagio sostenuto just a hair briskly, but still manages to evoke enough of a sense of mystery, and the less potent (than on a Steinway) bass notes add a nice flavor. The Allegretto serves as a sort of mildly upbeat shake of the lapel, and the Ashkar closes things out with fast and punchy Presto agitato. Again, the lower registers sound a bit different than normal, and some of Ashkar's tiny decelerations and pauses add just enough of a personal touch without straying too far from a conventional path. The opening set closes with Op 109. Here, Ashkar's playing in the Vivace ma non troppo does not evoke a particularly transcendent sound, and his approach combined with the instrument make it sound quasi-HIP. When he plays the highest notes there's a sense of sonic but not digital strain to the proceedings that intrigues, and in the coda, his playing takes on a very deliberate feel before transitioning basically attacca to a Prestissimo that is both potent but somewhat constrained dynamically, due to the instrument. This is not to say that the playing sounds puny or weak, just that the Bechstein, as recorded, doesn't create a wall-rattling sound, which is just as well; it presents a different take. The final movement opens with a more transcendent sound in the opening theme, and then with the first variation, Ashkar moves into a more conventional transcendent soundworld effectively. The second variation sounds deliberate and pointillistic and moves past the early 19th Century and almost into the early 20th. The third variation, effectively led by the left hand, sounds fast and smoothly undulating, and the fourth moves into more serene, transcendent playing. The transition between the fourth and fifth variations is marked by a slight discontinuity that sort of breaks the effect, but then the (not too) energetic fifth variation sets up the sixth variation which finds Ashkar playing with tender transcendence at the starts and more heft and vigor as it moves along, with his tone in the trills approaching what he does when on a Steinway, before the climax is reached, and then Ashkar returns to the opening material in beautifully serene fashion. An outstanding closer. So, a most excellent opening set. Ashkar adds some personal interpretive touches without veering anywhere near idiosyncrasy. Hopefully, the next release is not too far off. Superb sound, near or at SOTA levels. There's mechanism noise to be heard in a few places, but nothing detrimental. The piano sounds a little smaller in scale than in many contemporary recordings, and there's just a bit of distance - just the right amount it turns out. Decays sound quicker than a Steinway and slower than a Bösendorfer. Sonata no.6 in F major, op.10, no. 2; Sonata no.23 in F minor, "Appassionata", op. 57; Sonata no.26 in E-flat major, "Les Adieux", op. 81a; Sonata no.31 in A-flat major, op. 110. Last year saw the first volume Ashkar's cycle, and it was excellent. This year brings the second volume, though it is of the single disc variety, making me wonder if the whole cycle will be released in only four volumes. That's irrelevant, of course. To the music. The disc opens with 10/2. Ashkar plays the opening Allegro with playfulness and energy aplenty, and his Bechstein sounds tangy up high, though just shy of edgy. Ashkar's articulation and precision, and the at times snazzy sounding decay of the instrument, really juice things up. The Allegretto is then played in slow, controlled, perhaps slightly exaggerated fashion, but the effect is splendid. Ashkar then plays the Presto with real pep and some nice rhythm and dynamic control. He makes sure to keep the repeat, which is all to the very good. This is a world-class version of the sonata. Next comes Op 57. The Bechstein low frequencies don't offer the same imposing heft that Steinways or Bösendorfers can, but the more controlled tone is not unattractive, and as the movement unfolds, Ashkar's playing maintains nice tension throughout, and if it never explodes and achieves the type of power of some versions, it's somewhat weightier than primo middleweight versions like Lipkin's. It's a more refined light-heavyweight take, I suppose, with some passages of tonal attractiveness thrown in, the left hand playing is nicely insistent and consistent. Ashkar adopts a somewhat relaxed tempo and feel in the Andante con moto, and here the bass notes take on something of a tightened up, beefed up fortepiano sound. The right hand playing is quite lovely, and though it doesn't dominate, the left hand playing just keeps drawing the listener's attention. The closing Allegro is a speedy, punchy affair, with the crisp, almost brittle upper registers adding some pleasant sting, and the middle and lower registers coming at the listener. Ashkar pulls back for a respite near the end before running up to the coda. Superb. The disc closes with Op 111. The Maeastoso sounds satisfyingly dark and almost sinister, and the Bechstein bass adds enough spice to catch the ear. The Allegro is satisfyingly quick and forward moving, if not as intense or clear as some others. That's not to say that Ashkar is a slouch in those areas. The movement is never slow, but at 9'30", it's not especially fast, and then Ashkar then goes for a lengthy 19'32" second movement, bringing the whole thing in at just under a generous half-hour. The Arietta is slow, and the Bechstein decay imparts a different sound, with more space between notes and chords, aided by Ashkar's measured tempo. It's doesn't go super deep, but it is solemn. The first two variations, too. The third variation is less notable for its rhythmic swagger than for it's sharp accents and wide dynamics and hard-hitting fortissimo playing. The fourth variation starts off at a somewhat louder than normal volume, bubbling along for a bit, before transitioning to a more elevated style, with delicate but not moving "little stars", some fine trills, with the playing immediately before the second chain of trills uncommonly biting, and the ending is somewhat direct and blunt, though still quite attractive. Intriguingly, though long, the movement seems shorter than its length implies. So, Ashkar's 111, while very good, represents something a step down in terms of comparative quality. That written, it's still very high quality.